Below are software and services provided by the Department of Bioinformatics and Computational Biology. These tools are copyrighted by the University of Texas MD Anderson Cancer Center and by the individual employees of the cancer center who helped develop them. They are freely available for personal use in research projects; however, anyone wishing to use them or modify them for use in a commercial project should contact the Office of Technology Commercialization. TCPA is a comprehensive web-based resource for accessing, visualizing, and analyzing cancer functional proteomics. Next-Generation (Clustered) Heat Maps is a web-based tool for displaying zoomable (clustered) heat maps with links to statistical information, databases, and other related analyses. They now have a faster, more dynamic interface and a tool for building NG-CHMs within the Galaxy bioinformatics platform. TANRIC is an open-access resource for interactive exploration of lncRNAs in cancer. TCGA Batch Effects Tool V2 provides graphical and statistical analysis of TCGA data sets that identifies and corrects for systematic bias such as trend and batch effects. 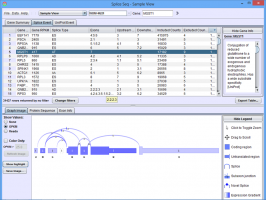 SpliceSeq provides a quick, easy method of investigating alternative mRNA splicing in next generation mRNA sequence data. TCGA SpliceSeq is a related web-based tool for exploring alternative splicing in thousands of TCGA samples. 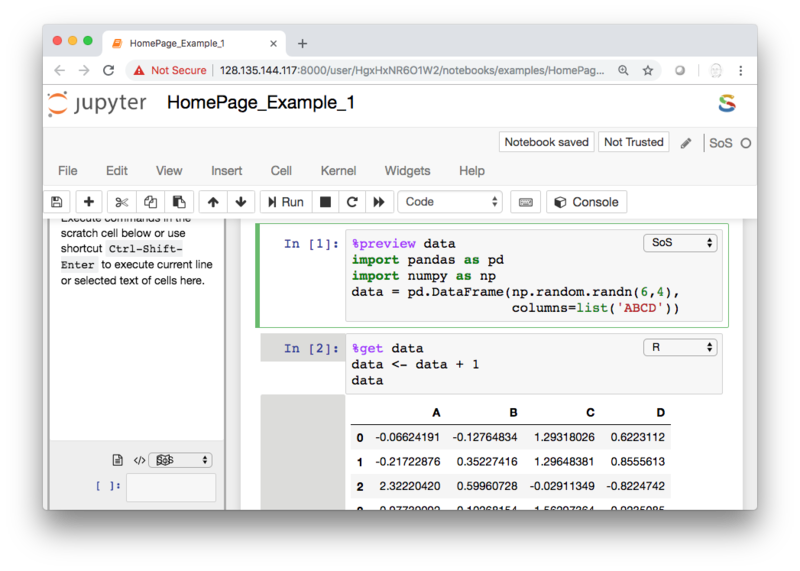 SoS (Script of Scripts) consists of the SoS Polyglot Notebook and SoS Workflow Engine, a multi-language environment for both interactive data analysis and batch data processing. A computational pipeline for identifying gene fusions from RNA-seq data. 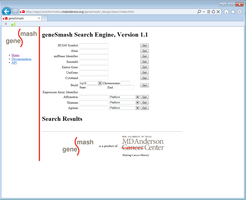 drugBase provides a RESTful interface to a database of drug-target interactions. DyCE is a server for enabling remote users to access advanced computational modeling and analysis tools and view the results of the analysis directly in their browser. A tool for predicting tumor purity, and the presence of infiltrating stromal/immune cells in tumor tissues using gene expression data. Estimate the probability of a germline mutation to be de novo using family history data. FamSeq is a computational tool for calculating probability of variants in family-based sequencing data. FASMIC is a comprehensive database of experimental-evidence-based functional impact of somatic mutations in cancer. An interactive tool for viewing the location and annotation of genes on a human chromosome. TP53 mutation is a main cause of Li-Fraumeni syndrome. This package is designed to estimate the probability that the counselee is a TP53 mutation carrier on the basis of his/her family cancer history. We also included LFS classic and Chompret criteria in the package. R package to help assess and correct for batch effects. MCLP provides a comprehensive resource for accessing, visualizing, and analyzing functional proteomics of cancer cell lines. Somatic point mutation caller for tumor-normal paired samples in next-generation sequencing data. Zoomable (clustered) heat maps with links to statistical information, databases, and other related analyses. This is Version 2 of the software, featuring a faster, more dynamic interface and a tool for building NG-CHMs within the Galaxy bioinformatics platform. An Open-Use Integrated API of Pathways, Genes, Directional Gene Interactions, and the Gene Ontology with Data Versioning for Provenance. SoS Polyglot Notebook and SoS Workflow Engine, a multi-language environment for both interactive data analysis and batch data processing. SuperCurve is a stand-alone package, bundled with OOMPA, that provides tools for the analysis of reverse phase protein arrays. This service provides a bioinformatic web app for identifying network-based biomarkers that most correlate with patient survival data. Use SurvNet. This service provides a bioinformatic web app for positive selection in proteins using a sliding window substitution rate analysis. Use SWAKK. The Cancer Genomic Atlas (TCGA) project studies different types of cancer by obtaining datasets from different tissue source sites, using different sequencing centers and technologies. Data sets can sometimes be biased depending on the batch from which it came. The TCGA Batch Effects Tool provides pre-computed graphical annotations of different TCGA data sets that allows users to screen for batch biases in the dataset. TCGA SpliceSeq presents an analysis of alternative mRNA splicing in thousands of TCGA cancer samples across 33 different tumor types. Percent splice in values for all possible splice events of all genes can be queried, graphically displayed, and downloaded. An open-access resource for interactive exploration of lncRNAs in cancer. A comprehensive resource for accessing, visualizing, and analyzing cancer mitochondrial genomic data. A comprehensive resource for accessing, visualizing, and analyzing cancer functional proteomics. TransVar is a multi-way annotator for genetic elements and genetic variations.